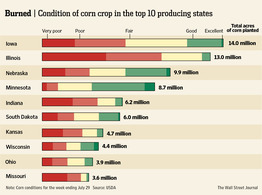 Across the United States heartland, a drought is impacting corn farmers. Emerson’s Alan Novak, director of the alternative energy and metals and mining industries, shares his thoughts on its impact on the fuel vs. food debate. The worst drought to hit the US in 56 years (a good summary can be found in a Reuters story published yesterday) is generating increasing discussion around the impact of the Renewable Fuel Standard (RFS) on the US corn, and broader meat, dairy and poultry markets. An interesting op ed on this topic appeared in the New York Times earlier this week. For those not familiar with the Renewable Fuel standard, here’s a quick review from an earlier post. Briefly, the RFS mandated the production of various types of biofuels for blending into the US transportation fuel pool. The volume of conventional biofuels required, primarily corn-based ethanol, peaks at about 13 billion gallons. As the industry has increased production to meet this requirement the portion of the US corn crop dedicated to ethanol production has risen to more than 30% of the total crop (and potentially higher this year). While this is not an issue while yields and total production are increasing, it is appearing as a significant issue during the long, hot summer of 2012. …resulting in record corn prices which will ripple through the balance of the food chain over the coming months. Will this corn market price pressure translate into a broader food vs. fuel debate? Only time will tell, but an increasing impact at the grocery store will likely intensify the discussion. Posted Friday, August 3rd, 2012 under Energy.